Yeah. Not great. 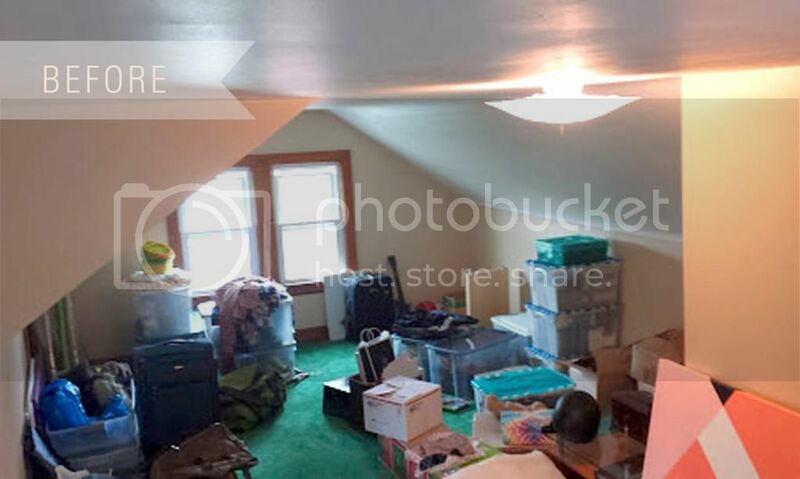 When we moved in, we used the attic as a dumping ground for our junk and hadn't gone through it since. 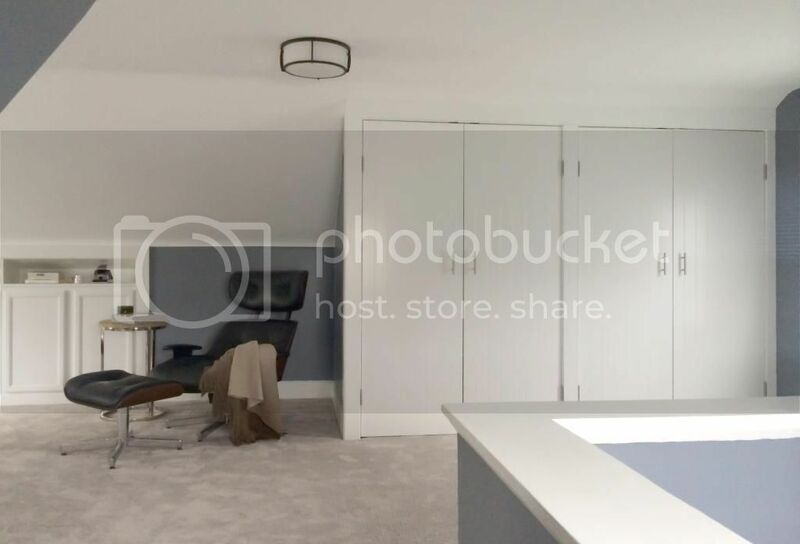 Not to mention the green carpet and unpainted wood trim – not exactly the type of space you'd want to spend 8 hours a day in. We also knew our junk wasn't going anywhere, and that we'd still need long-term storage for things like Christmas decorations and childhood items. Jim and his dad drew up a plan to include a closet, built-in cabinets, and shelving that would store our things out of sight and keep the space tidy. Painting the ceiling, walls, and raw wood trim would transform the space, and the green carpet had to GO. 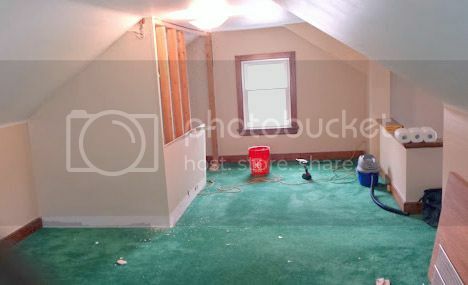 The floors underneath were nothing special so re-carpeting was the best option, and also would make for a cozier room. We opted for hardwood floors throughout our entire house, so we liked the idea of having something different upstairs. 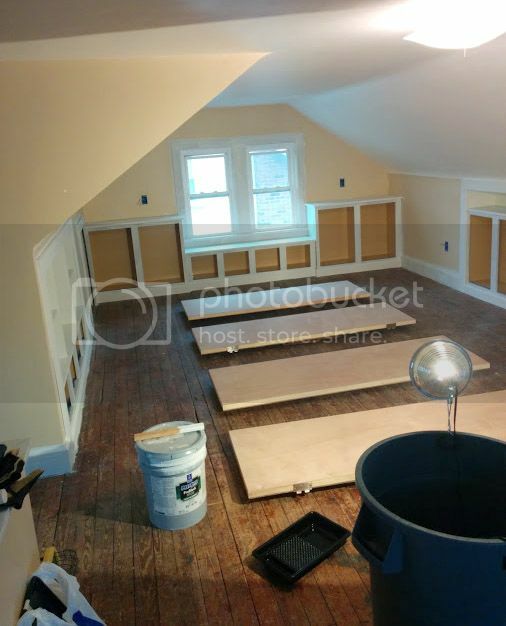 The guys started by ripping the existing closet out – then they built a new structure, which would feature four doors instead of the tiny single door we had before. After the closet framing was built, we ripped up the carpet and installed the cabinets. The walls on the left and right of the photo were cut away, so the cabinet units could be built in – which helped us maximize the room's square footage. Once the structures were in, we spent WEEKS painting. Seriously. Weeks. Every cabinet door had to primed, painted, flipped...repeat. The trim had to be primed and painted (all the way down the stairs, all around the windows, all of the shelves) as well as the walls and ceiling. There was so much surface area to cover...we were having flashbacks to our first few weeks in the house! When we finally finished, we organized all of our storage items and purchased the furnishings for Jim's office setup. It was important for the room to continue our house's modern cottage style, but to also feel a little masculine. 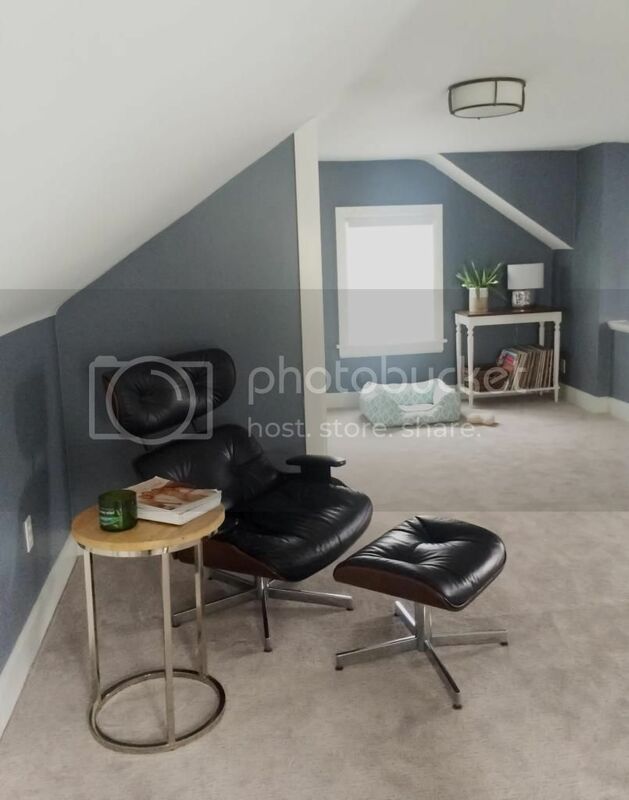 To achieve that look, we chose Serious Gray by Sherwin Williams for the walls, and accented everything in Pure White semi-gloss. The custom shelving around the windows gives added storage to a previously useless wall – we went with contrasting metal brackets to enhance the cottage feel. The shelves are a perfect place for storing books and nicknacks...and a mini bar (because it's a long walk down to the kitchen, duh). We bought a few air plants to add life – they're low maintenance and enjoy all of the natural light this room gets. The plants and cute containers are from Bird and Feather Co. on Etsy. 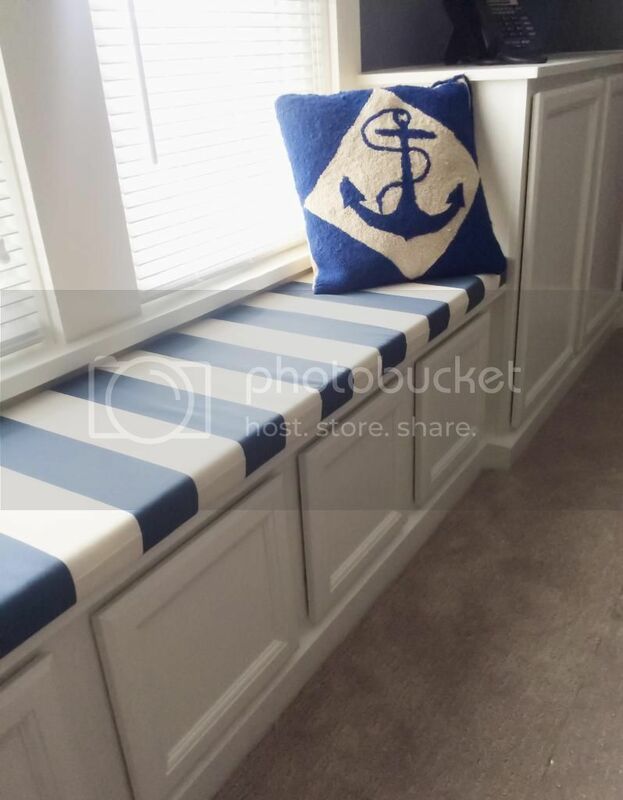 I LOVE that the cabinet layout allowed for a window seat, they're so charming and we knew Cooper would enjoy sitting here and looking outside. We ordered it custom through Cushion Source—it fits perfectly and came in about four weeks. The new closet features double doors for easy access, and there's a clothing bar and shelves for off-season clothes and shoes. 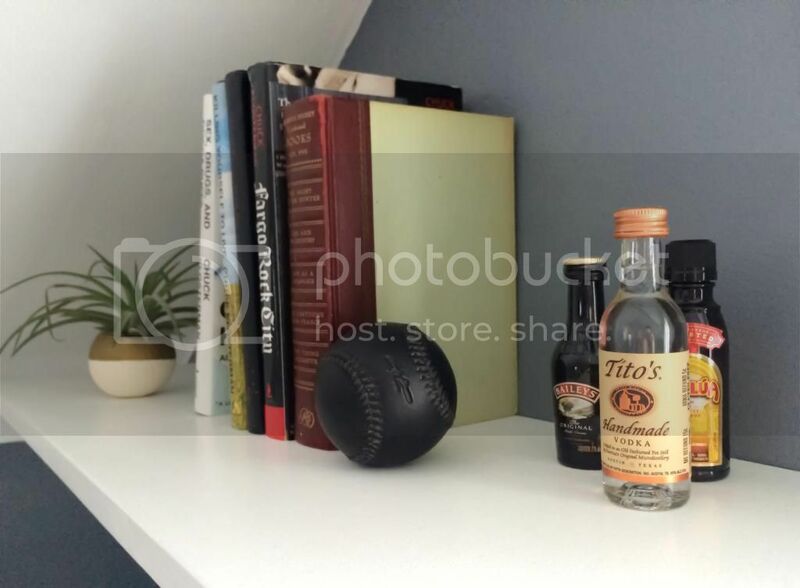 The Eames lounger was a Craigslist score – Jim gets all the credit for tracking it down! We only had one TV in our living room, so adding another one up here keeps us from fighting over the remote. We chose an internet TV with apps to avoid the messy cables, and truthfully we watch most of our shows on Netflix and Hulu anyway. 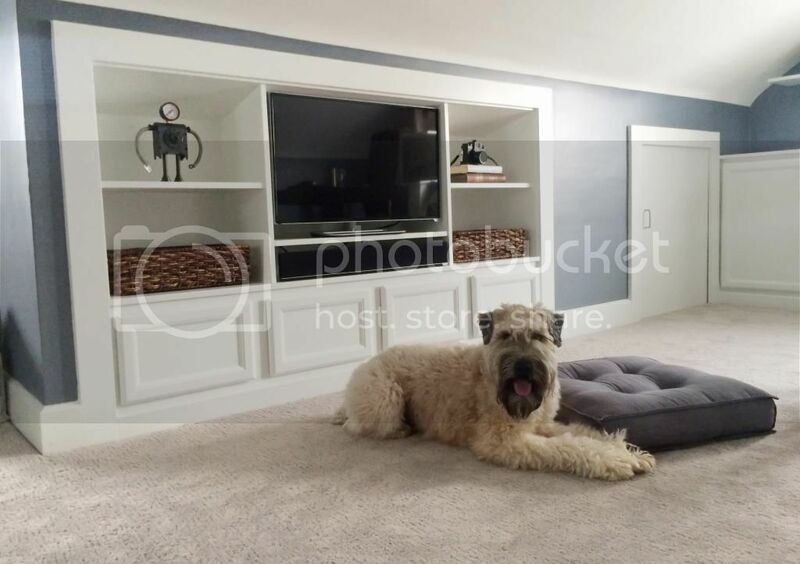 Jim custom built this TV cabinet with a perfectly measured shelf for a sound bar (because why not). We picked up the floor cushion at World Market to cozy up the floor space (and for Cooper to lay on, let's be serious). 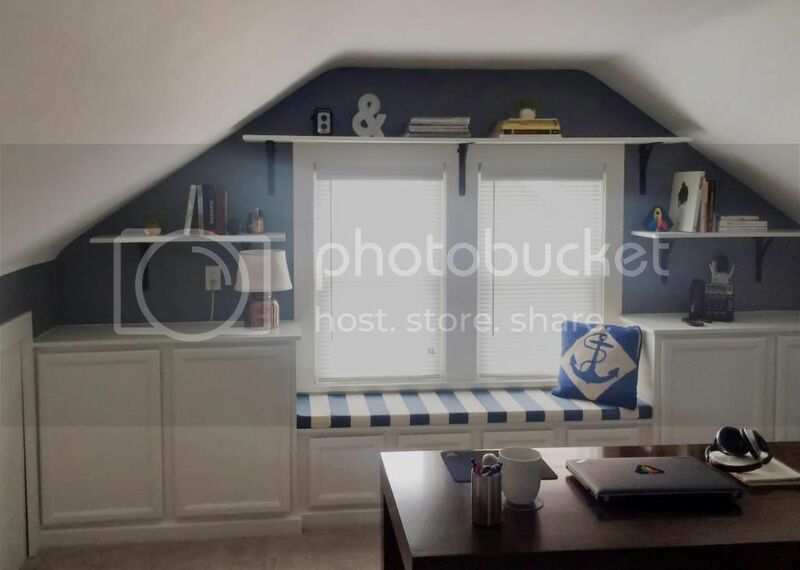 A nook for reading or watching TV. 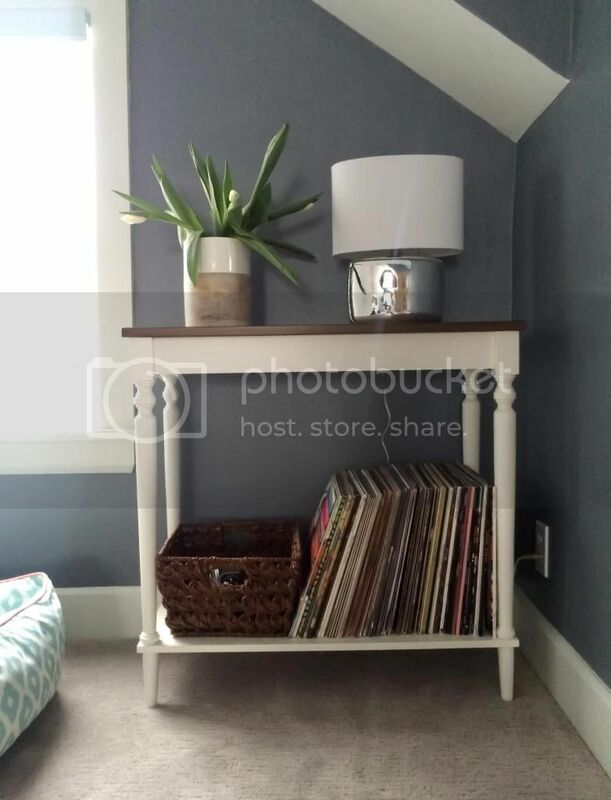 We added a console table in the corner to hold a lamp for more light, and it doubles as storage for my record collection. The table and lamp are both from Target. Overall we're SO thrilled with this complete makeover – it turned out to be more work than we anticipated, but it was worth the long process. It's done and we love it. 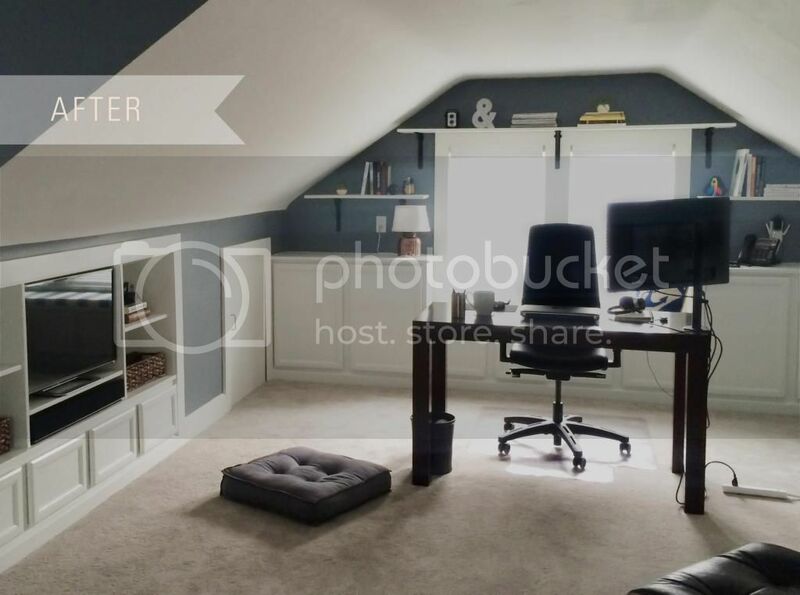 It adds a fully-functional room to our house, where an empty, useless room existed before. All of junk is still there, you just can't see it! We've already enjoyed spending time up here, and know we'll get a lot of use out of the room. Additionally, it will add great resale value to our home. It feels great to be done! I hope you guys enjoyed our little attic tour, and please feel free to message me or comment with any questions about our process! Great job! The thought of all that painting gives me heart burn. Worth it though!